"A developed highly functional small satellite "ASNARO" is equipped with optical sensors of high ground resolution, but the production cost decreases one-third the cost of large satellites. The highly functional small satellite with low price and short delivery time maintains sophisticated functions. This was achieved by small-size and weight-saving technologies that the persons concerned built up for many years.". We interviewed with the President Kaoru Yano of NEC Corporation about the company's basic strategy for future space business. The Society of Japanese Aerospace Companies (SJAC) has been implementing the �gSpace Industry Annual Survey�h every year, in order to grasp the actual status of space industry in Japan. The result of the survey is published under the title of �gJapanese Space Industry Annual Survey Report�h. This survey has been achieved by compiling the answers for the questionnaires to the related companies, and is the only material to overview the status of Japanese space industry. Hereunder, the outline of the survey is provided. "Even the Kashima earth station received a SSCC signal transmitted from the ATS-1 satellite and produced global imaging. I processed the analog signal digitally using a computer and an A/D converter, digitalized the strength of the light and drew a round global picture with a printer. I think that I am the first person in Japan who achieved a global digital image processing from a geostationary satellite". 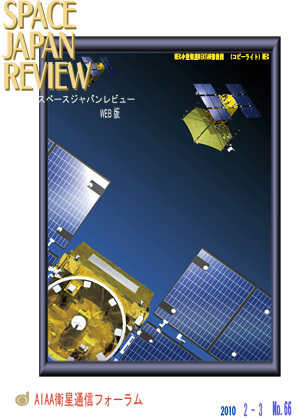 This issue is entitled "the experimental age using US's communication satellites" as the 2nd issue written by Mr. Kazuhiko Hashimoto following the preceding issue in No.65, Space Japan Review. TV and telephone signal transmission experiments using the Relay satellite, which started from 1964, Time-Division-Multiple-Access (TDMA), Code-Division-Multiple-Access (CDMA), satellite ranging, global imaging transmission experiments using the ATS satellite, which started from 1966, are presented in this issue. You will know the various world first and Japan's first experimental run of events. Please enjoy yourself. This article was reprinted with the permission of Aerospace America. pp.32-36, Feb. 2010. Why is the surface of the recent satellite black?